What is Transliteration and Its Disadvantages? Transliteration is one method of typing Gujarati using an English keyboard. In my opinion, transliteration is an inferior method, time-consuming, inefficient, and cumbersome in some respects. I'll explain the disadvantages after explaining what transliteration is. Transliteration is one method of typing Gujarati by typing the English equivalent. Transliteration might seem simple at first but there are many drawbacks. For example, typing special characters, such as ઽ (અવગ્રહ avagraha), ૐ, ।, ॥, ૠ, ઋ, ઍ, etc., is impossible, unless the transliteration prorams provides a way to enter them. Many websites offer transliteration. Some, such as Google Transliteration, have built-in dictionaries that try to give you suggestion as to what to are typing because of the unpredictability of transliteration; but this slows down the speed of typing. If you want the best method of typing Gujarati using an English keyboard, you can use my Gujarati Phonetic keyboard, which is a way to type Gujarati naturally. Transliteration generally refers to English to Gujarati - meaning typing English to obtain Gujarati. However, we can do the reverse as well - meaning Gujarati to English transliteration. For example, 'અનિર્દેશ ગુજરાતી' can be transliterated into English as 'anirdesha gujaraatee' using strict rules. I have created a script that converts Gujarati Unicode text to English found here: Transliterate Gujarati Unicode Text to English Text Using Strict Transliteration. The rest of this page discusses Gujarati to English transliteration. This sounds simple but it's complicated depending on the tool you use. Below are just a few of the websites that uses transliteration to convert English input into various languages, such as Gujarati, Hindi, Marathi, Telugu, etc. Some transliteration tools do not have a built-in dictionary. So you have to use strict transliteration rules. These rules are found here: Strict Transliteration Rules. Some tools, such as Google Transliteration, has built-in dictionaries. It offers several choices to guess what you are trying to type. For example, if you type 'samajavu', it may suggest 'સમજવું' or 'સમજાવું'. With strict rules, you would have to type 'samajavu' for 'સમજવું' and 'samajaavu' for 'સમજાવું'. But it's almost impossible to get the anusvara (mindu) on the 'વુ'. Because this is seemingly impossible, Google give suggestions and also includes a menu item for inserting special characters, which include characters that cannot be typed with transliteration, such as ઽ (અવગ્રહ avagraha), ૐ, ।, ॥, ૠ, ઋ, ઍ, વગેરે. In general, the Candra vowels cannot be typed in transliteration. * Natural Gujarati with Gujarati Phonetic keyboard. Initially, typing "B i g v t ' g I t i" to get 'ભાગવત્ ગીતા' may seem strange, but once you study the keyboard, it will make sense and become natural. Notice that when you're typing 'ઇન્દ્રિયો', you have to try either 'indriyo' or 'indreeyo'. This can slow you down. What if you wanted to write 'ઇંદ્રિયો' instead? There's no way to type alternative. With natural Gujarati, it's simple. Unpredictability: Transliteration is unpredictable. That's why Google Transliteration offers suggestions to guess what you are typing. The above example of 'samajavu' shows unpredictability. Another example is 'maharaj'. Does this mean 'મહારાજ' or 'મહારાજા'? What about 'sudharavu'? Is this 'સુધરવું' or 'સુધારવું'? Even with strict transliteration rules, it can be difficult. For example, what is 'tha'? Is it 'ઠ' or 'થ'? Is 'dha' taken to be 'ઢ' or 'ધ'? There are many, many examples. There's not a sure way to type exactly what you mean with transliteration. This is why the Gujarati keyboard or Gujarati Phonetic keyboard are the best methods of typing Gujarati because all of the Gujarati consonants are assigned a key on the keyboard. You only have to learn those key assignments. Keyboard maps for both the Default Gujarati keyboard and Gujarati Phonetic keyboard are found on this site. Let's take another example with using Google Transliteration to write 'આનંદ'. 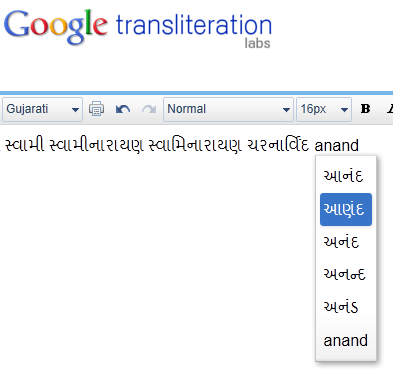 The image below shows that typing 'anand' can give many choice, such as 'આણંદ', 'આનંદ', 'અનંદ', વગેરે. If instead we use the Gujarati Phonetic keyboard, we type 'An>d' for 'આનંદ' and 'AN>d' for 'આણંદ'. No Seamless OS integration: With transliteration, there's no seamless integration into the OS. Hence, you would have to cut and paste your text into Microsoft Word, Explorer search box, or browser's search box etc. What if you wanted to name a file 'મારો ખજાનો'? You'd have to type 'maaro khajaano' in the transliteration tool, copy and paste into the Save dialog box. That's type consuming. With straight Gujarati, you would just press Alt+Shift to change to Gujarati and type it right in the Save dialog box. BhashaIndia.com does have an offline transliteration tool that can be installed in Windows; but it's awkward to use at best. Google also has an offline transliteration tool that can be install in Windows; but again, it uses pop-ups to give suggestions; hence it's not that seamless with the OS.